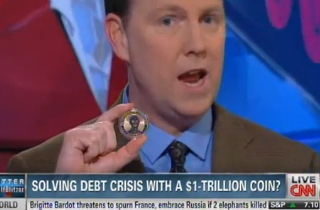 CNN Asks: Can We Solve The Debt Problem With A Big Ol' One-Trillion Dollar Coin? CNN Asks: Can We Solve The Debt Problem With A Big Ol’ One-Trillion Dollar Coin? Lots of people seem to have creative ideas (or so they believe) for solving our federal government’s massive debt problem. This afternoon, CNN explored one of the more… umm… whimsical… ones. “It sounds crazy but some economists, some legal scholars say it is legal and could be done,” CNN reporter Brian Todd explained this afternoon of a strange new proposal to pay off the federal debt by having the Treasury mint a $1 trillion platinum coin. Congressman Jerrold Nadler (D-NY) is behind the plan, saying, “I’m being absolutely serious … It sounds silly but it’s absolutely legal.” Todd also spoke to an economist who claimed the coin would be better than a government shutdown or defaulting on the debt. So, in other words, a trillion-dollar coin is a better option than two of the many dreaded options. Convinced? And what if the coin got stolen? Well, Todd relates that horrifying situation to a… umm… classic(?) scene from… Austin Powers: International Man of Mystery.